← Am I being dumped by Eveden? Discount website Groupon has had to rethink its plastic surgery offer policy following heavy criticism from the Advertising Standards Authority. Groupon claim to have addressed the ASA’s concerns by extending the deal period required for similar adverts. How very noble of them. Now, I respect individual’s rights to augment their body should they so choose. 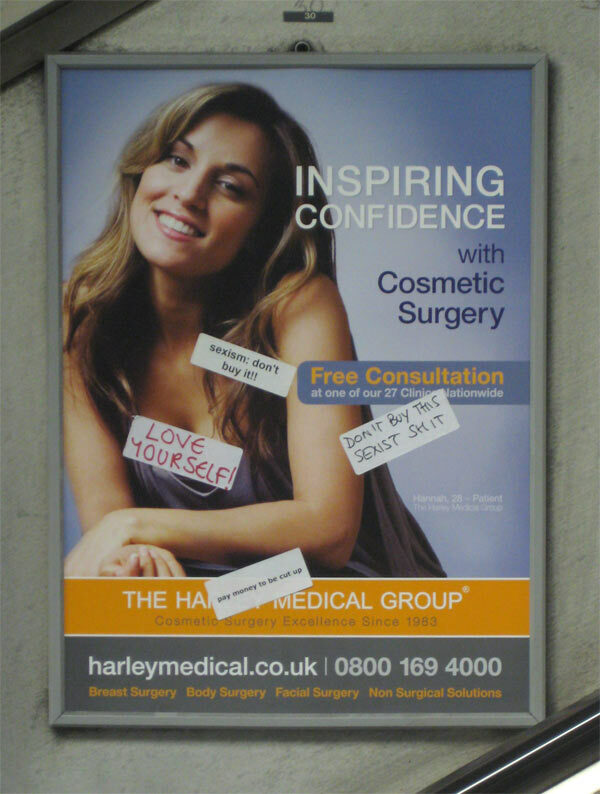 But cosmetic surgery adverts are irresponsible at the best of times. All of those posters at the back of magazines, on the tube and even on television, erode any sense that paying large sums of money for someone to cut you up is not a normal thing to do. It is not. Hating your own body is not a normal thing to do. Feeling as if you might just be good enough if you can find cash enough subject yourself to the pain of someone chopping bits off you or stuffing new bits in to you is not a normal thing to do. The ASA “criticism” is not even close to going far enough. I would argue that – like cigarettes – all plastic surgery advertising is irresponsible and should not be permitted anywhere. Photo from the awesome Uplift Magazine. This entry was posted in Feminism, News. Bookmark the permalink. While I believe surgery is sometimes an empowering option for self loathing women, this is disgusting. It plants seeds in the minds of women who would otherwise not be self conscious. This is propaganda at its sleaziest. Groupon seem to have fallen foul of ASA, http://www.bbc.co.uk/news/business-16000648 doesn’t give any of the examples but I wonder if this is one.